First step? Click here and begin your journey. This valuable tool will empower you to assess the level of emotional safety in your relationship. The answer key will provide accurate and helpful feedback about your most important relationship. Having trouble communicating with your partner? Find my latest blog post here. Dimension One: Are the messages you exchange with your partner clear and complete? 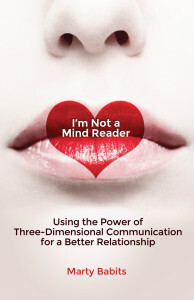 Dimension Two: Do you and your partner “get” the feelings underneath the words? Dimension Three: Do you and your partner create emotional safety within and between yourselves? Three-dimensional communication™ creates emotional safety. Willingness to learn it opens the door to secure attachment. Many couples seek improved communication. You can learn to expand what is possible and positive in your relationship. “I can’t read your mind, but I need to know your heart.” Ever feel that way? Read Chapter Six, it was written with you in mind. What are the two most glaring mistakes partners make in thinking about how to work on their relationships? You will be surprised to learn what they are. Read Chapter 10 and the mystery will be solved. Order now! • Where understandings can help you resolve discord generated by genuine differences? If you are looking for help in your relationship you are very likely unable to see this place clearly. Perhaps you’ve seen it but didn’t recognize what you were witnessing. Perhaps you have never—not even within your imagination—had a glimpse of it. This is the Middle Ground. 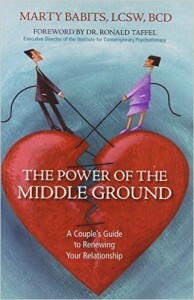 This book will help you identify the middle ground potential in your relationship and guide you in developing it. Order now! Marty Babits is available for speaking engagements! Contact him here with any inquiries, questions, concerns or comments.